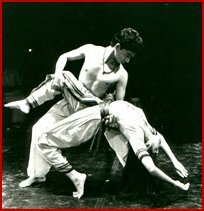 MADHUGOPINATH, VAKKOM SAJEEV AND KALAMANDALAM ANAND are the founders of the SAMUDRA Centre for Indian Contemporary Performing Arts and are leading figures in the field of contemporary Indian dance and music. Madhu Gopinath and Vakkom Sajeev are trained in Bharathanatyam under the able guidance of Guru. Smt.V. Mythili and in Kalaripayattu under Govindankutty Gurukkal at the CVN Kalari. They are also well versed in Yoga, Rope Mallakhambh, Pole Mallkhambh and Gymnastics. Kalamandalam Anand is a renowned Chenda and percussion artist with a Diploma in Chenda Melam from the Kerala Kalamandalam. S.Dasan, is a Mridangam artist, graduated from the Swathi Thirunal Music College, Trivandrum. "THE SOUND OF SILENCE" is an innovative and original dialogue between movement and sound, body and soul, tradition and modernity. The Samudra dancers and musicians explore through 'the Mother', the contradictions and sensuality of the life force that governs us all. Acclaimed both in India and abroad, it has been performed at the Iddac Dance and Music Festival, the Spoleto Festival in Italy (July, 2001) and at the Royal Opera House, London (September 2001).